Standing 2.5m tall in assembled height. Standing 3.1m tall in assembled height. Standing 4.1m tall in assembled height. So you have decided that you would like to use a flag to get across your message. Outdoor flags are a versatile advertising solution and are great for attracting the attention of people in a busy area or from a distance. We have a number of different shapes including a simple rectangle, feather and teardrop also known as sail flags. When choosing the most appropriate shape of flag for you the priority will be how it fits with your brand and messaging. Our flags are available in: small, medium and large heights. See our size guide above and please note that sizes differ between teardrop and feather flags. The height of the flag will be dictated to by how you are using your flag. Here are some examples of how we have seen our flags being used. Believe it or not we have seen small flags being used indoors to draw your attention to a particular store area, in this instance it was a product demonstration area. A line of flags can be used on the forecourt of a garage using drive on bases, to draw your attention to garages. Using small flags for this purpose directly next to a road with no obstructions does the job perfectly! With just over half a metre of additional height to the small flag, medium flags can get additional cut in a busy area. 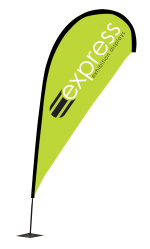 Customers have used these flags in shopping centres and at the entrance of a marquee at a fete or county show. At just over 4 meters high, the large flag will be easily seen from a distance. These are ideal in highly populated areas, we have seen them being used at a number of places including music festivals and charity events such as marathons where they have been used as location markers, helping runners to get to their support areas. When designing the creative message for your flag you need to take into consideration the shape and also how it is going to be used. 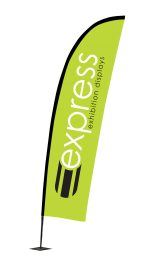 Unlike many display products where a customer will often walk directly to the display to read more information, flags are often seen from a distance, therefore you need to ensure that your message is concise, focusing predominantly on your logo and a key strap line if space allows. See our blog post giving you hints and tips about designing your flag. Once you have chosen the flag type that you are going to use don’t forget your base, the type of base is dictated by the height of the flag and the surface that is it going to be used on. See our flag base section for more information.